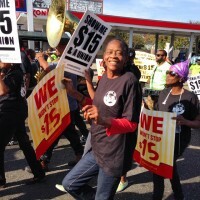 Fifteen Dollars for Fast Food Workers – More to Come? New Orleans Fast food workers in New York State got some great news after a three year campaign. The wage review board set up by Governor Andrew Cuomo has announced, as expected, that it will recommend a $15 wage for many fast food workers in New York State. The increase, once approved will stair step the wage up to $15 over the next six years statewide by 2021 and in New York City will accelerate faster and reach the $15 per hour number in three years by 2018. This is unquestionably a huge victory for service workers and their unions and their community-based partners, like New York Communities for Change, formerly New York ACORN, and the Working Families Party. Hip-hip-hooray! The wage increases will impact fast food workers working in the big chains with 100-stores or more, so clearly the MacDonald’s, Taco Bell’s, Popeye’s, Burger King, and the like. Outfits like MacDonald’s have already agreed to go to $9 now and $10 next year, so they seem resigned to reality. Reports indicate that there are 180,000 fast food workers in New York State. It is unclear how many are employed in the 100-plus-store chains, but presumably this number would approach or exceed 100,000 workers. The $15 per hour minimum wage has now won favor and is on an implementation timeline in Seattle, Los Angeles City and County, San Francisco, and Washington, D.C. The New York plan is the only one that singles out fast food workers rather than all workers in a jurisdiction. Mayor DeBlasio and others in New York City continue to argue for the $15 wage to be spread to all workers, not just fast food workers, and this should put some wind behind their sails. 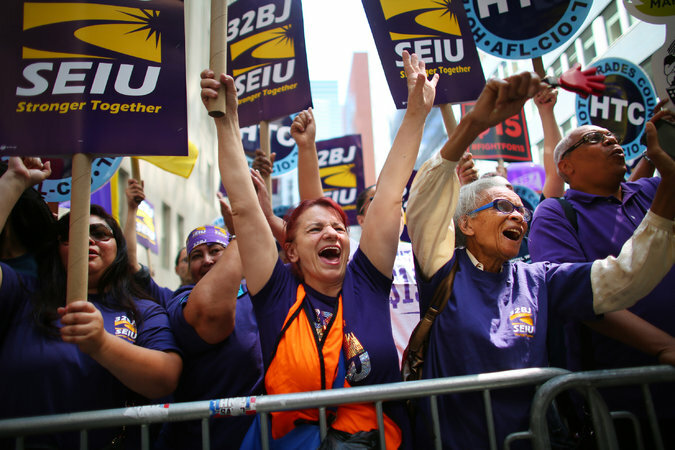 SEIU’s giant New York-based building services local, 32B-J, has announced a strike for airport related workers in their campaign for a $15 per hour wage for contractors there, so the fast food move will be a shot in their arms as well. God and the government should both know they need it. A report from the nonprofit Tax Foundation found that in cities like Washington, D.C. spending $1 will buy only about 84 cents worth of goods compared to the rest of the country where in places like Mississippi and Arkansas spending $1 will get you about $1.15 worth of goods. That’s little comfort though. Bill Lipton, the director of the New York Working Families’ Party, was quoted calling the wage recommendation a huge victory for the “99%.” Given the polarized politics of the country and the huge division between rich and poor, it’s worrisome what will happen in the rest of the country, where the fights are still concentrated on winning a ladder to $10 or $11 per hour? We may start having to talk about tales of more than two cities, with the rich and poor divided, and the poor and poorer also divided. Little progress seems forthcoming in Congress on enacting President Obama’s now dusty proposal for a $10.10 minimum wage for example. This is a clear victory, but there will have to be many, many more of them before New York’s Governor Cuomo’s words that “other states will follow” can come true. A victory in New York for 100,000 workers helps the 99% in New York, but that hardly moves a decimal point in the rest of the country, and the 98.9% are still desperate for a raise. Celebrate for the day, but there’s a lot of work still to be done tomorrow! Birmingham, England Before catching a plane for the UK, I went down with fifteen Local 100 United Labor Unions members and supporters with our t-shirts on to join the New Orleans piece of the national rally and demonstrations for raising wages to $15 per hour for fastfood and other workers in the US. We met in the parking lot of the new Whole Foods grocery store in New Orleans on Broad Street in Mid-City, no small irony there, since they are not the best on wage issues by a long shot, but they are at least smart enough to look the other way when 50 people are mustering in their parking lot. Our crowd was pretty typical of what has become the “new normal” for these kinds of events around the country. A smattering of union activists from the local labor council, AFGE, and others who were in town to help with the endgame of the Landrieu election for Senate were there. There were some red-shirts saying Unite HERE for the local union. There were shirts identifying a local immigrant rights organization and one saying Legalize Arizona from the marches there several years ago, a t-shirt and action I was proud to participate in as well. There were some shirts calling for $15 per hour, who I assume were a combination of local and out-of-town SEIU folks but none of us knew any of them other than the national campaign organizer assigned to New Orleans who had convened the meetings that had brought all of us there. Perhaps there were two or three workers from McDonald’s and other fast food operations. One spoke briefly before we marched over to the McDonald’s on Canal Street next to the RTA Building named after A. Philip Randolph, the former legendary head of the Brotherhood of Sleeping Car Porters. There weren’t many civilians. This was a labor-for-labor rally. It was a gorgeous December day in New Orleans with temperatures in the 70’s, so t-shirt weather all the way. There was some whispering before we began about the fact that contrary to earlier claims, four workers had been fired the previous year for their participation, three days after the annual rallies. Nonetheless, we were encouraged to parade individually through the store. It was all good-spirited with whoops and chants and whatnot. Many were surprised and confused to read the news reports later that some people had been arrested since this had somehow happened off to the side or after the main column had gone on about their business. On the whole this is all good stuff. We need to have unions and union activists standing up for lower waged workers, especially given the tenuousness of their employment. Advocating for higher wages for workers is 100% the business of unions, and given the frozen minimum wage, fast food workers are good poster people for the campaign. A portrait of a leader of these actions from Kansas City profiled in the New York Times was inspiring. This is decidedly not about unionizing these workers, nor a strike in any way, but none of that should detract from the fact that it’s the right thing to do, and we all should do our part.